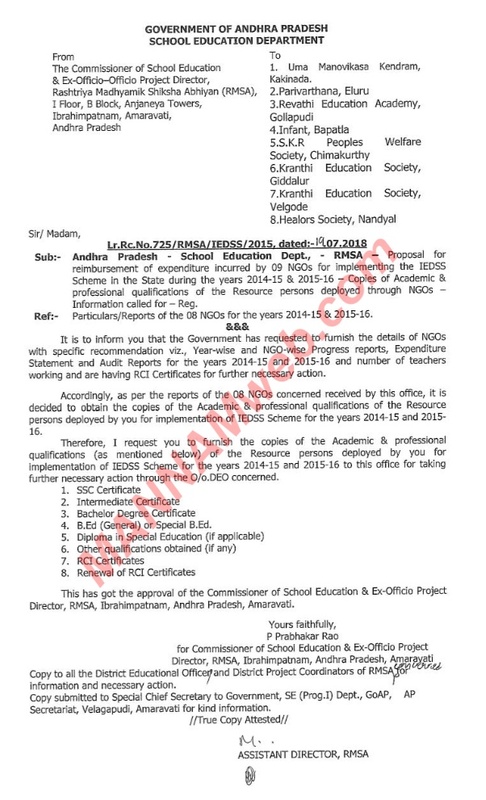 Andhra Pradesh - School Education Dept., - RMSA – Copies of Academic & professional qualifications of the Resource Teachers deployed through NGOs concerned fro the years 2014-15 & 2015-16 – Information/ documents submission called for – Reg. It is informed that in the Lr.Rc.No.725/RMSA/IEDSS/2015, dated:-19.07.2018 to the NGOs, it is requested to furnish the copies of the Academic & professional qualifications (as mentioned below) of the Resource persons deployed by NGOs for implementation of IEDSS Scheme for the years 2014-15 and 2015-16 to this office for taking further necessary action through the O/o.DEO concerned. 4. B.Ed (General) or Special B.Ed. So far this office has received only from East Godavari District. The District Educational Officers of West Godavari, Krishna, Guntur, Prakasam and Kurnool are once again requested to send the particulars with above mentioned documents to this office so as to take further necessary action in this regard. Few NGOs responded to the above letter and they submitted the copies of the above mentioned certificates directly to this office. Hence , I request you to bestow your personal interest and submit the relevant copies of the Resource Teachers deployed by the respective NGOs of the year 2014-15 and 2015-16 separately through proper channel to this office NGO wise and District wise on or before 22.11.2018 without fail for taking further necessary action in the matter.